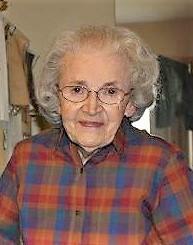 Mrs. Joyce Carpenter Staton, 86, of Bethel, Kentucky, passed away Wednesday at her home after a brief illness. She was born at Kendall Springs in Bath County, Kentucky on May 25, 1932 to the late Chester Cleveland and Beulah Craycraft Carpenter. Joyce was a 1953 graduate of the Good Samaritan Hospital School of Nursing in Lexington, Kentucky. She started her career as a registered nurse at the Veterans Hospital in Lexington and later became the Bath County Health Nurse at the Bath County Health Department. She was also employed part-time at Ridgeway and Hilltop Nursing Homes. She was a member of the Owingsville Church of Christ and was a great fan of the Lawrence Welk Show. In addition to her parents, she was preceded in death by her husband, Manuel Clay Staton. Survivors include one daughter, Cheryl (Steve) Thornsburg of Bethel, one sister, Maxine (Harold) Jones of Kendall Springs, three grandchildren, Adam (Andrea) Thornsburg, Margo (Micah) Gibson and Dustin (Ashley) Thornsburg. Five great-grandchildren, Ethan Gibson, Arrah Thornsburg, Kylesa Thornsburg, Ben Thornsburg and Hudson Thornsburg. A special friend who she considered the son she never had, Ronnie Robinson and special friend and caregiver, Donna Hedges Perry. Funeral services will be conducted 10:00 A.M. Saturday in the chapel of the Michael R. Gray Funeral Home in Owingsville with Brother Alton Norman and Dr. Sean Bailey officiating. Burial will follow at the Longview Cemetery in Bethel. Visitation at the Michael R. Gray Funeral Home in Owingsville is after 5:00 P.M. Friday. Pall Bearers will be Jimmy Neal Robinson, Neal Vance, Robert Purvis, Brian Warner, William Smith, Jamie Ferrell, Patrick Armitage and Matthew Armitage. Honorary bearers will be Ronnie Robinson, Bobby Jones, Bruce Jones, Bobby Staton, Mickey Staton, John Wills, Terry Crouch, Jimmy Kissick and Ronnie Bailey. In lieu of flowers contributions are suggested to St. Claire Hospice, 201 Lyons Avenue, Morehead, Kentucky 40351. Funeral arrangements are under the direction of the Michael R. Gray Funeral Home in Owingsville.